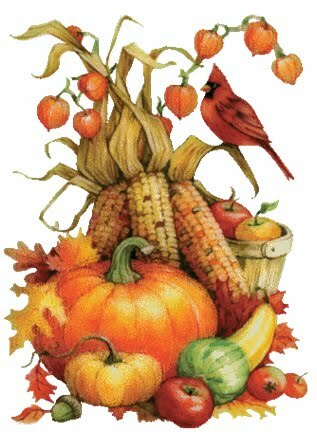 Join us in celebrating this Thanksgiving season by donating canned food the week of November 15th. Help us meet our goal of 300lbs! The generous contributions will be donated to the Low Country Food Bank. What ever pounds are donated to our officeby November 19, Classic will match pound for pound. Please drop off canned goods at our office, 1832 River Road between 8:00-4:00. Our goal 300 pounds. Let’s make it 600! And feed our community. 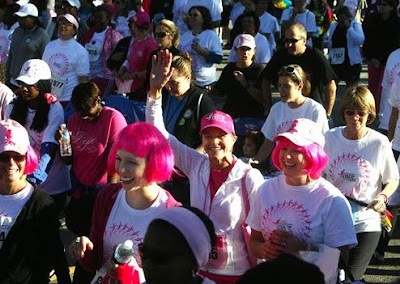 Thanks to those of you that rallied together at Saturday’s Race for the Cure. Each participate understanding that early detection is the key to breast cancer survival. And, with most of the proceeds going to educate the public, these efforts will help to overcome this disease. Team member, Sue Fleming who in addition to being our Marketing Director is a RN working in cancer treatment for local oncologists, sees first hand the impact of breast cancer and how early detection correlates to longevity and quality of life. Learn these important signs; share them with your children, friends and colleges. The Think Pink campaign is there to make each of us proactive. While screening mammograms are clearly important, not all breast cancers are found by mammograms. The most common sign of breast cancer is a new lump or mass. It is important that any new mass, lump, or breast change is checked by a health care professional with experience in diagnosing breast diseases. When embarking on a kitchen remodel first prepare a realistic budget and then search for someone who will work with you to achieve your goals. 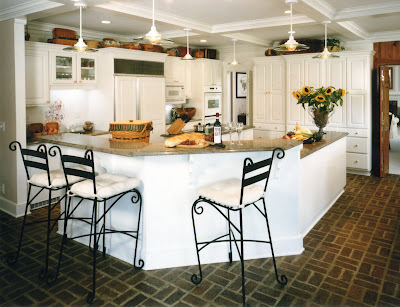 Remember, there are many shifting variables affecting kitchen remodeling estimates. But working within a client’s budget is essential. This is where you stating realistic goals and realistic budget requirements becomes critical. Our longevity in business and 100% client satisfaction rating attests to the fact that our prices are merited. Here are some general guidelines that are factually accurately. 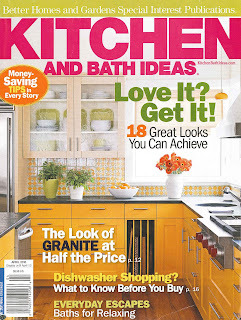 This will brighten up a kitchen without making any major changes in the physical space. This is a step up in both price and quality. You will have more choices. This is generally a full scale renovation. With a bigger budget comes a broader array of choices and prices to match. While costs statistics evaluate trends of a typical remodel, they exclude one thing –your thought processes, your objectives and your personal budget. All of which are unique to you and embraced by our team. 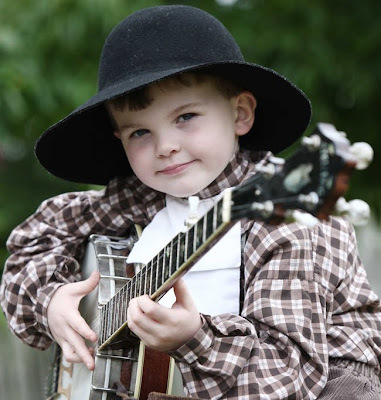 We are feeling the end of summer blues and looking to beat it with Bluegrass fever. Look for our team at the BBQ & Bluegrass Festival at Boone Hall Plantation on Sunday September 5. While we won't be able to personally celebrate with each of you, we will treat those of you that mention this blog to us and sign a design contract by September 23 to mouth watering barbecue provided by Classic from Home Team Barbecue (specifics and value confirmed prior to contract signing). Feeling the Blues - beat it with Blues Fever or better yet Home Team BBQ on Classic. 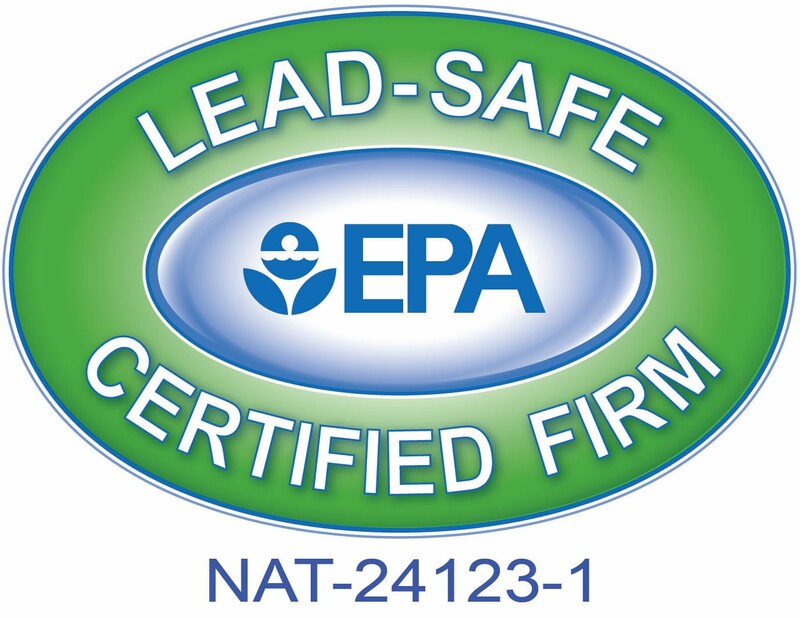 Lead EPA Reugulations Embraced by Classic Remodeling and Construction, Inc.
New EPA regulations are now in place for dealing with homes containing lead-based paint. No More “Business as Usual”. A new, federal law went into effect in April that will mandate the way remodeling contractors do business. The EPA developed what is known as RRP, or Renovate, Repair and Paint Act. It applies to all homes built before 1978 that risk disturbing lead-based paint during repairs, remodeling or painting activities. Remodeling firms must now be certified and their employees must be trained in lead-safe work practices. Please be sure that anyone hired to work on your pre-1978 home be certified by the EPA and has fulfilled the mandatory training requirements. Classic Remodeling and Construction, Inc. in Charleston, SC has been certified by the EPA and has Certified Remodelers on staff that have completed the training. We are certified to test the paint in your home prior to starting any remodeling project, to determine if your home has lead-based paint and would fall under the RRP guidelines. According to the EPA, about half of the homes built before 1978 have lead-based paint. The likelihood of finding lead-based paint increases with the age of the home. Lead can be dangerous to both adults and children. Rember to hire a certified lead professional. Not only is that the law but it will help protect you and your family! To the chagrin (though not to the surprise) of many remodelers, a number of home builders have entered our market recently due to the advent of decreased new housing starts. While remodelers have long understood the intricacies related to a remodeling project and the differences between building from scratch as opposed to managing existing structures, builders turned remodelers are now expressing that sentiment. 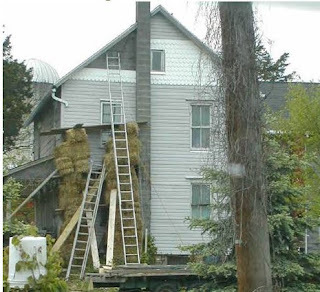 Remodeling and home building are two very different professions. They each require a unique set of skills and interests. While this revelation is not news to remodelers it is a surprise to many clients and their contractors, who are literally falling down on the job. Buyer by aware and buyer be smart! At Classic Remodeling we have something that makes children smile and parents enjoy their newly fixed up spaces. It has been fun on the many occasions when parents have told their kids," Bob the builder is here". 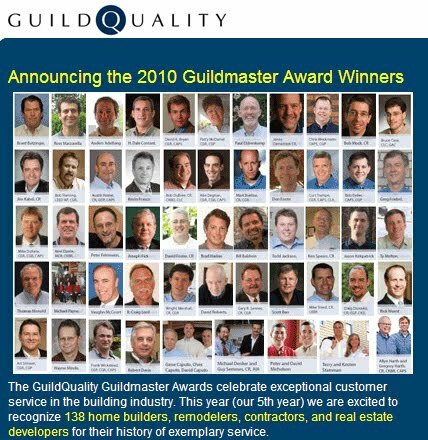 These 55 Quality Leaders have the highest level of customer satisfaction among remodelers as measured by GuildQuality Inc. www.guildquality.com. We are proud that Classic Remodeling is on this prestigious list! 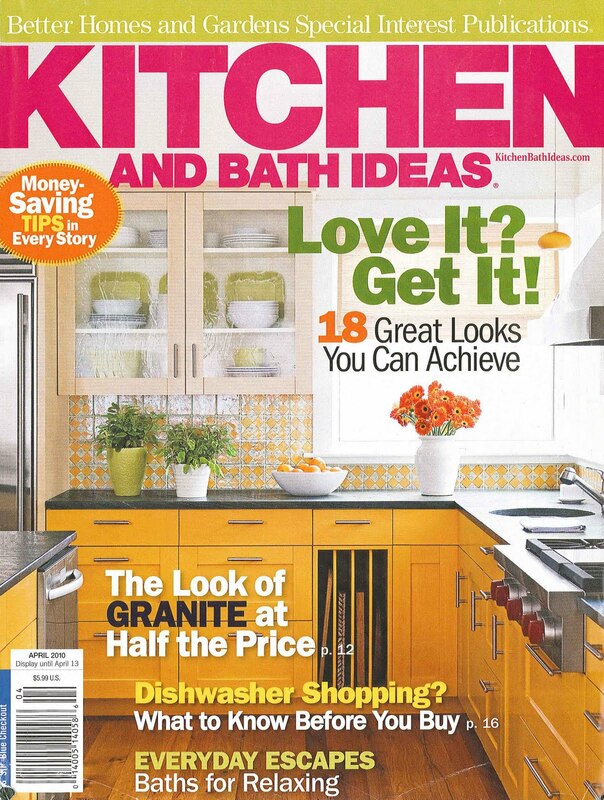 Qualified Remodeler magazine partnered with this leading firm offering third party customer satisfaction measurement. The result is a list of remodeling firms that excel at satisfying their clients. 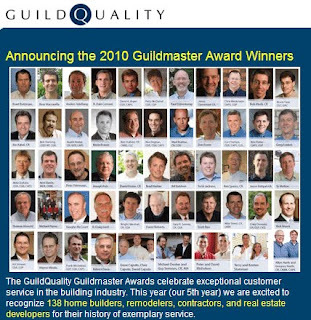 It can not be argued that these 55 remodeling firms — all members of GuildQuality’s 2010 class of Guildmasters – represent the best of the best in all of the remodeling industry across our country! 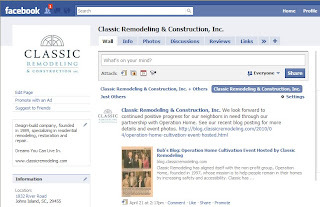 Please take a moment to search for Classic Remodeling & Construction, Inc. on Facebook, and "like" our page. Or, follow this link. 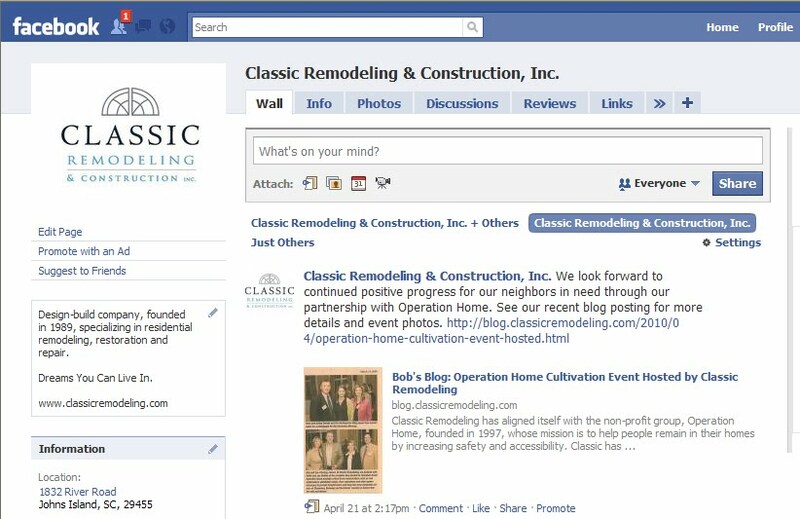 Classic will be using our Facebook page to keep our clients and friends updated on our latest news, trends and projects. We plan to interconnect our website, Blog and Facebook page, so that it is easy to navigate between each platform. Feel free to leave your comments and suggestions on our Facebook wall. We would love to hear from you! 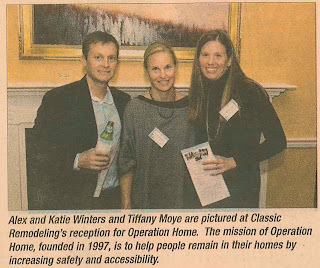 Classic Remodeling has aligned itself with the non-profit group, Operation Home, founded in 1997, whose mission is to help people remain in their homes by increasing safety and accessibility. Classic has made the long term commitment to provide skilled labor to complete critical home repairs such as roof replacements, wheelchair ramps, floor reparations, and other repairs necessary to prevent homelessness. As part of the Operation Home Contractors Committee, our goal is to determine the scope of work at homes in need and help triage the projects. By organizing the backlog of Operation Home aid requests, other individuals and/or companies can adopt cases through volunteer work or by providing financial assistance. 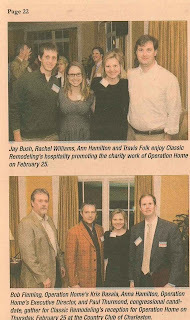 Recently, Classic Remodeling hosted a cultivation event for Operation Home at the Country Club of Charleston. 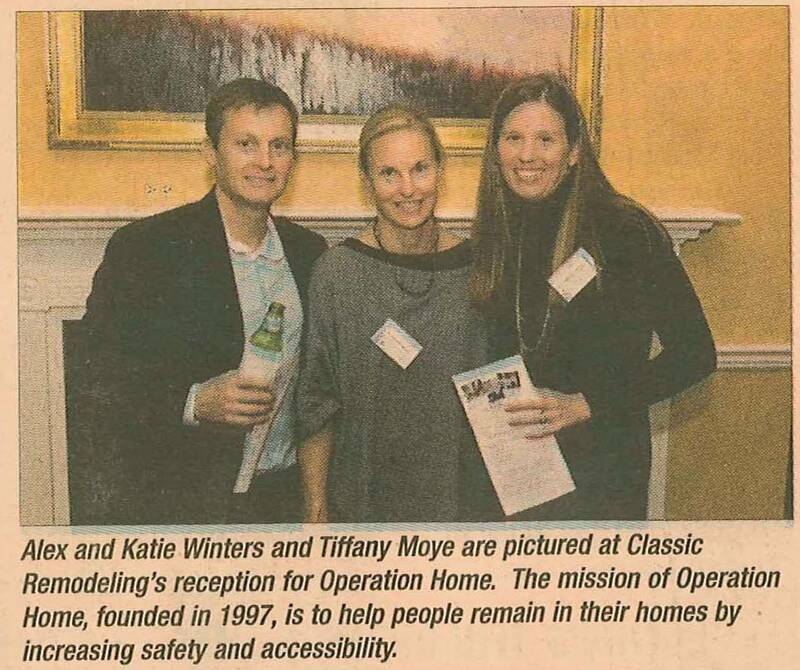 Our goal was to initiate interest in Operation Home with other individuals and companies in the Lowcountry. Attendees heard brief remarks from Charleston City Councilman Paul Thurmond and representatives of Operation Home. Willingness to embrace Operation Home’s mission was evident with over 60 people in attendance. Our combined efforts will go far to provide secure, affordable and weatherized homes for our neighbors in need. 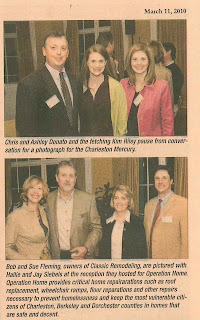 The Charleston Mercury and Charleston Home Magazine were both in attendance and provided excellent media coverage post event. 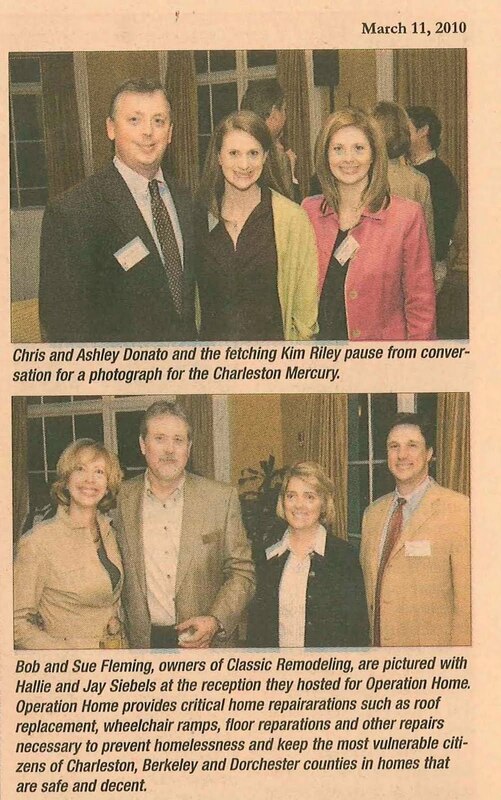 Included are a few images of attendees from the Out and About section of Charleston Mercury. For more information or to learn how to get involved with Operation Home, click here. 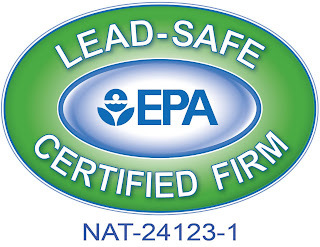 Recently, Classic Remodeling & Construction, Inc. became a U.S. EPA Lead-Safe certified firm under the EPA Renovation, Repair, and Painting (RRP) Rule. Classic remains invested in continued education for its employees to stay informed and familiar with the latest industry trends and technologies and to comply with industry requirements and guidelines. Remodeling and renovation activities like sanding, cutting, and demolition can create hazardous lead dust and chips by disturbing lead-based paint. Under the EPA rule issued in 2008, beginning in April 2010, contractors performing renovation, repair and painting projects that disturb lead-based paint in homes, child care facilities, and schools built before 1978 must be certified and must follow specific work practices to prevent lead contamination. 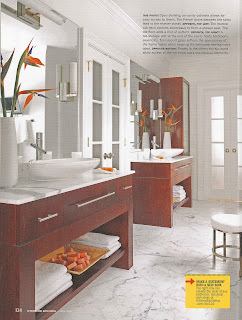 We invite you to pick up the April 2010 issue of Better Homes and Gardens: Kitchen and Bath Ideas for a glimpse at the master bathroom of Abby and Fred Himmelein. The home was built as a Civil War hospital, split into two single-family homes in 1871, and moved to a new lot around the corner in 1911. When the Himmeleins purchased the home, the master bath was "poorly constructed" fashioned from a screened-in back porch. The Himmeleins tasked Classic Remodeling with designing and constructing a light-filled bath that made efficient use of the space while melding contemporary design sensibilities with the historical structure. Photographer Anthony-Masterson captured with perfection the beauty of the custom cherry cabinets, marble floors and counters, white tub and vessel sinks, and polished nickel faucets. Staycations Are In! Create Your Own Outdoor Oasis. With the economy lingering in the doldrums, many families are holding off on spending thousands of dollars to take a vacation abroad. Instead, consider the alternative of creating a personal oasis in the comfort and convenience of your own backyard. 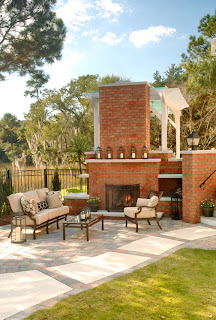 Consider stone fireplaces for cozy gatherings; pergolas and gazebos to resemble a faraway oasis; flat screen televisions seamlessly incorporated into outdoor surroundings; weatherized dining tables suitable for family style meals or an intimate dinner for two; and elite, gourmet grills containing storage, sinks and refrigerators. For a fraction of the cost of a journey abroad, a remodel or addition can help turn your travel dreams into a staycation reality. 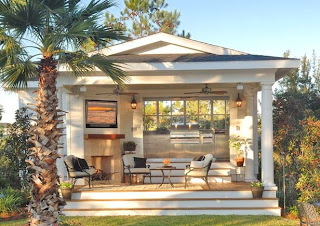 Best of all, the benefits of your outdoor space remodel can be enjoyed long after the normal duration of a one to two week vacation abroad. 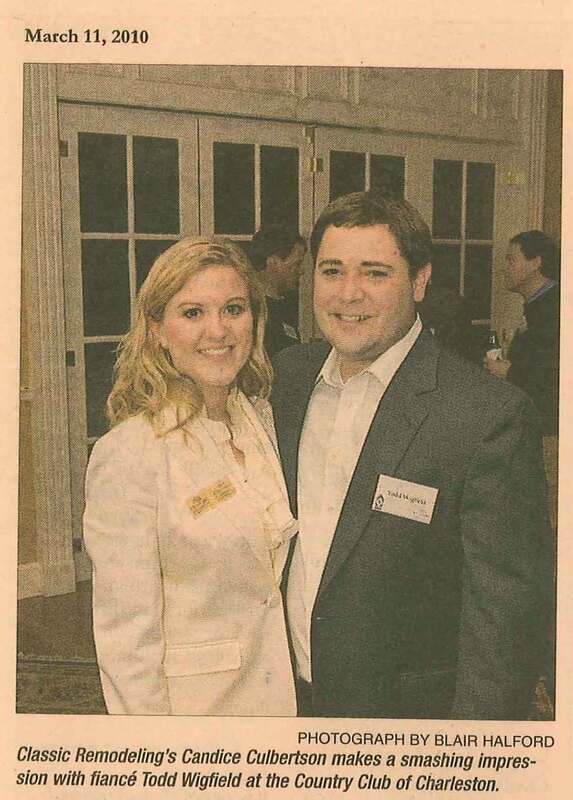 Below is an excerpt from the Monday, February 1 issue of CharlestonCurrents. Bob Fleming, president of Classic Remodeling & Construction on Johns Island, recently earned the Certified Green Professional (CGP) designation from the National Association of Home Builders. According to the NAHB's directory, Fleming is the only person within a 50-mile radius who has the registered designations of Certified Green Professional and Certified Graduate Remodeler. The Certified Green Professional designation recognizes builders, remodelers and other industry professionals who incorporate green building principles into their work without driving up the cost of construction. Classwork leading to the designation provides a solid background in green building methods as well as the tools to reach consumers. In addition to Fleming's NAHB distinctions, he is also a Leadership in Energy and Environmental Design Accredited Professional (LEED AP), awarded through the U.S. Green Building Council. "At Classic, I encourage all my employees, in the office and the field, to train and strive for designations that will ultimately provide a higher level of service and expertise for our clients," said Fleming. "The remodeling and construction industry is constantly changing, and it is our responsibility to be a resource of knowledge and experience related to the latest products and technology." Fleming established Classic Remodeling & Construction in 1989. 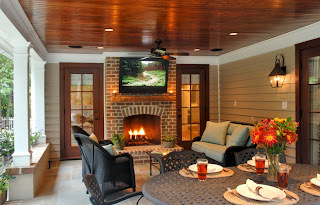 It's the largest full-service, design-build company in the Charleston area. The company is an underwriter of CharlestonCurrents.com. Check out Classic Remodeling's "Rooms with a View" feature in the Winter 2010 issue of Charleston Style and Design. Or visit www.charlestonstyleanddesign.com to read the article online. The article highlights the three projects in which Classic Remodeling helps integrate indoor and outdoor living spaces for our clients. Below are a couple of the photos, shot by Tripp Smith, included in the article. Please see the full article for more photos. What perfect spaces for family gatherings!